Photo by Tour De Manure. The Sierraville Tour De Manure cycling event takes place this Saturday, June 20, 2015. Riders can choose between 3 route options that travel along Historic Hwy. 49 in the Sierra Valley. The 62, 42, and 30 mile routes are supported with rest stops and SAG wagons. 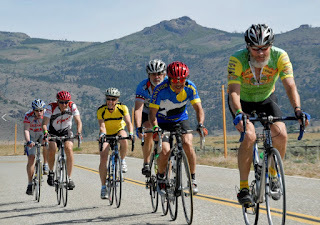 The Sierra Valley is a lightly traveled area with sweeping views of ranch lands to mountain tops. Wildlife, birds, and farm animals can be seen along the relatively flat routes. The ride concludes with a T-shirt, post ride lunch, and live music at the Sierraville firehouse. Draft beer from the Brewing Lair will be served while you enjoy the music by Michael Hogan and the Simpletones. Proceeds from the ride benefit Sierraville Volunteer Fire and Rescue. Registration is online and on the day of the event. Registration begins at 7:00am, Saturday. Riders should get rolling between 8:00am and 9:00am.